Clary Sage Oil has been used for centuries to help support the female body and it's own challenges. Supports healthy attitude during PMS; and my support for menopausal women emotionally due it's balancing nature*. It contains sclareol which is very rare when distilling essential oils. Clary Sage is contained in Dragon Time, Endoflex and SclarEssence essential oil blends. Consider these blends for balancing and supporting of women's emotional wellbeing. I find that if I use it for stressful days, it immediately stops that mind chatter that is so disruptive to clear thinking. This section is a fun and easy reference guide for Clary sage oil. It will tell you how to use it and what to use it for. It will also provide you with some fun suggestions, safety precautions for you and your pet! As I receive new tips and testimonials for Clary sage oil they will be added to the page, so check back frequently! Want to Purchase Therapeutic Grade Clary Sage Oil? Go to the Oil Shop! Buy Clary Sage Oil here! For instance, many times Clary sage oil is confused with the common sage (salvia officinalis). I can assure you that these are very different oils. Where is the name derived from? Salvia comes from a Latin word "salvere" meaning "to save". Clary comes from a Latin word "clarus" meaning "clear". What is the ORAC Value? 221,000 µTE/100g. Wow! This is rich in Antioxidants! Did you know that in the Middle Ages, Clary sage was nicknamed "Clear Eyes"? An infusion, made from the seeds. What are the Plant Properties? Calming and balancing. What are the Documented Uses and Benefits of Clary Sage? Supports healthy attitude during PMS; and my support for menopausal women emotionally due it's balancing nature. What is the Aromatic Affect on the Mind? It can be very quieting to the mind, and euphoric. Spicy scent, sharp and grassy. What is the Spiritual Influence? For those who can sit still enough to quiet the mind and gain clarity, this oil is for you. Notice how your mind will calm by just holding the bottle. If our brain is racing, it is difficult to know what to do next or how to do it for that matter. When we are relaxed and focused, ideas flow to us naturally and we embrace their meaning. Use clary sage oil to bring the mind back into the moment so you can enjoy the stillness rather than the chaos. It also is known to enhance one’s ability to dream, so watch out! What Chakra is Affected? The root and sacral chakras. What is the Corresponding Chakra Color? Violet. Can this Oil be used for Animals? Yes, however, I choose to use it in a specialty blend only, rather than use it alone. 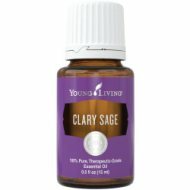 One of my favorite blends that contains Clary Sage is Into the Future. It is great for leaving the past behind and moving forward! Note about Animal Use: Certain oils can be very toxic to cats. Pine and citrus oils in particular when they are not of therapeutic quality. Please consult your vet if you are not sure about applying any essential oil to your pet. Clary sage oil has no known contraindications. It is Generally Regarded as Safe (GRAS). It is approved by the FDA for use as a Food Additive (FA). Children under age 6 years old should not use Clary Sage as a dietary supplement. Keep out of reach of children. Avoid using on infants and very small children. Pregnant women should use caution. If pregnant or under a doctor's care, consult your physician. Did you know that clary sage is in the Mint Family, Lamiaceae? The Mint Family produces the most chemotypes of any plant family. Did you know that in Oriental Medicine, clary sage oil circulates and strengthens Qi-Energy that is "stuck"? Qi (or Chi) is considered our life force or energy that flows through our bodies and sustains our physical body. Place a few drops of Clary Sage on wrists and neck every day to balance occasional blue feelings or mind chatter.